Warm weather favorites unite in a refreshingly light and vibrant chilled soup. 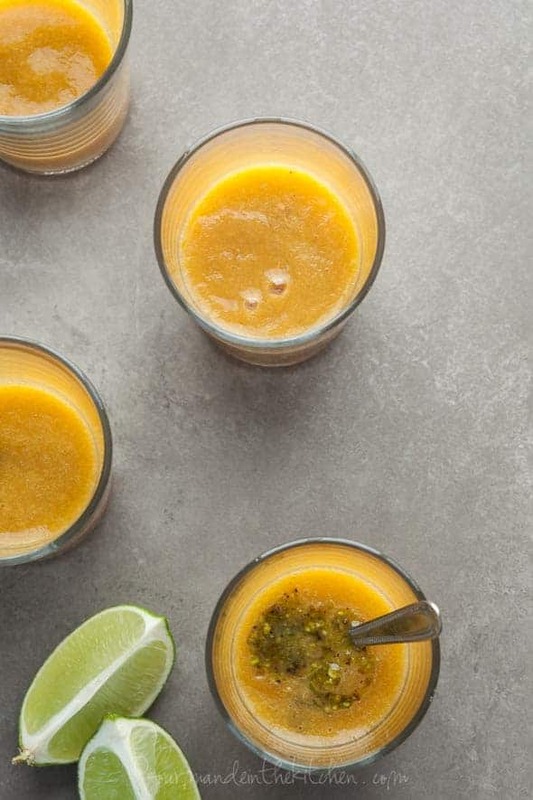 While a steaming bowl of soup is probably the last thing that comes to mind when temperatures are on the rise, sipping on a chilled version is an entirely different story. Sometimes a chilled soup is just the thing for beating the heat. Although summer is still young peaches are already making an appearance and they are soft, sweet and juicy. 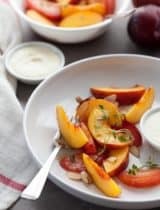 While I think the best way to enjoy them is straight off the tree or fresh from the market, this chilled soup recipe comes in handy whenever you find yourself with too many peaches that have gone ripe at once. That’s the thing about peaches, there are bound to be a few in the bunch with one too many bruises to wait any longer to eat them and this is an easy way to put them to good use. With just a few minutes of work and no stove involved this soup takes minimal effort to put together. 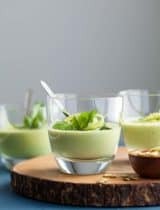 Everything goes right into the blender and gets blitzed into a silky puree that’s chilled until icy cool and topped with a pistou of sorts made from fresh basil and pistachios. 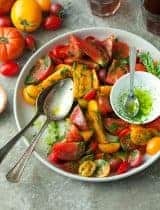 Ripe yellow heirloom tomatoes join the peaches, adding a savory undertone while lime juice and zest bring a lively acidity and add a vibrant note. A pinch of salt ties the savory and sweet elements together and makes the whole thing sing. Basil adds a touch of peppery brightness and pistachios a rich nutty counterpart. 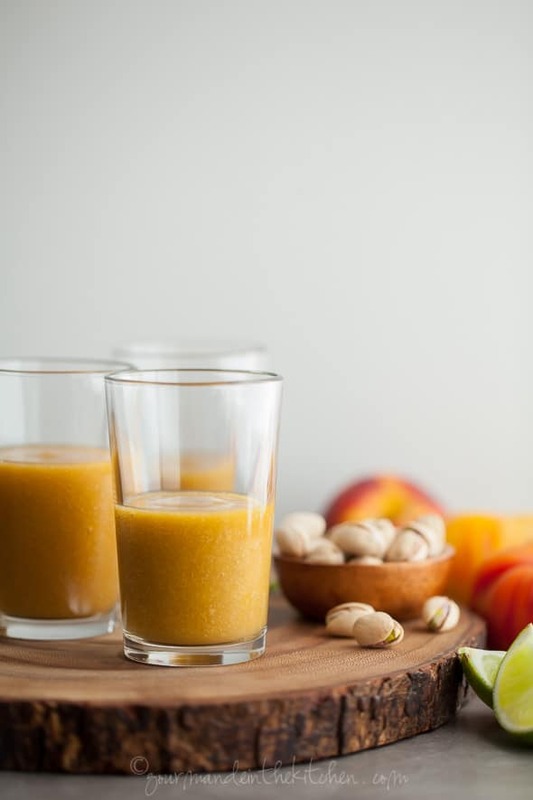 Serve this cool refreshing sip as an appetizer, a not too sweet alternative to dessert after a rich meal, or swap the tomatoes out for more peaches for a purely fruit-filled sip anytime of the day. What are your favorite summer soups? Warm weather favorites (tomatoes and peaches) unite in a refreshingly light and vibrant chilled soup. Peel the peaches and tomatoes using a sharp paring knife (the skins should come off fairly easily if ripe) or by briefly blanching in boiling water. To blanch peaches and tomatoes make a small slit with a paring knife at the base of each. Gently lower into a large pot of boiling water for 30 seconds. Using a slotted spoon remove the peaches and tomatoes from the hot water, and plunge into an ice water bath to cool. The skins should slip off. 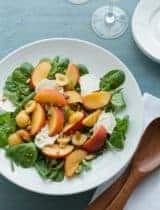 Combine the peeled peaches and tomatoes with a pinch of salt and four or five large basil leaves in a blender along with the lime juice and lime zest. Blend on high until smooth and finely pureed. Taste and season with additional salt if needed. Refrigerate until well chilled (at least 2 hours). 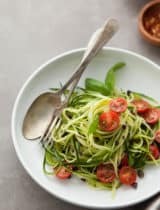 Meanwhile make the pistachio basil pistou by pulsing together the shelled pistachios and four or five basil leaves with a pinch of salt in a small food processor or finely chop by hand with a sharp chef’s knife . Add the pistachio oil and pulse until just combined or stir into the finely hand chopped basil and pistachios. 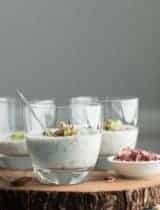 Serve soup in chilled bowls or glasses topped with the pistachio basil pistou. OMG this sounds amazing and it is SOOO beautiful!! Love this!! I can't wait to try it. This looks delicious. 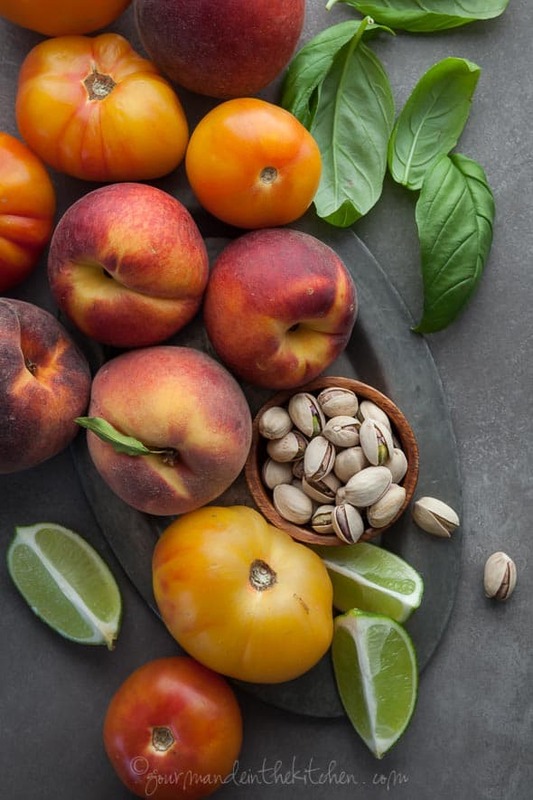 My little patio is overflowing with tomatoes and basil right now, and peach season is just really hitting its stride--I think I'll be trying your soup out soon! I agree with you that hot soup doesn't always sound the best on hot summer days. But this chilled soup sounds perfect! Can't wait to try it! You're months ahead of my produce here, and I am forever jealous. Perfection. This soup is so perfect for a hot summer day. Love that pistachio basil pistou! So beautiful and I'm intrigued by the sweet, savory combination! Love the color too! 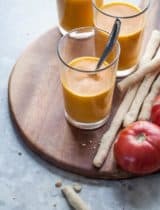 I've done peach and tomato salsa and thought it was such a lovely pairing... this soup must be equally refreshing and I love the addition of the pistou. I imagine it adds some nice texture. What a great little starter to a dinner party. This looks so light and delicious! Perfect for Summer. I am definitely going to have to try this. This chilled soup sounds delicious. Never thought of making chilled soup before, but now I am convinced :) I love peaches, so I bet your soup tastes super delicious. Pinned too! Love gazpacho soups. 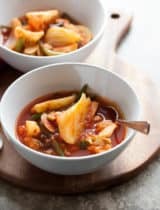 This sounds like a delicious cold soup as well and looks so refreshing. Perfect for a summer lunch. What a glorious treat! Love peaches!! What a beautiful soup! Love the flavor combination! Lovely combonation of flavors I'm loving for this hot weather! I've always been curious, what makes a chilled blend of ingredients a soup and not a smoothie or say a gazpacho? I call this a coup because it has a savory element to it from the tomatoes and the pistachio basil pistou but yes it's similar to a gazpacho in concept.